In Time Range: Shows the number of incoming conversations during based on the time frame, channels, and tags as filtered above. This month: Shows the number of incoming conversations in the current month. This week: Shows the number of incoming conversations in the current week. Today: Shows the number of incoming conversations in the current day. Last 30 Days: Shows the number of incoming conversations in the past running 30 days. Last Month: Shows the number of incoming conversations last month. 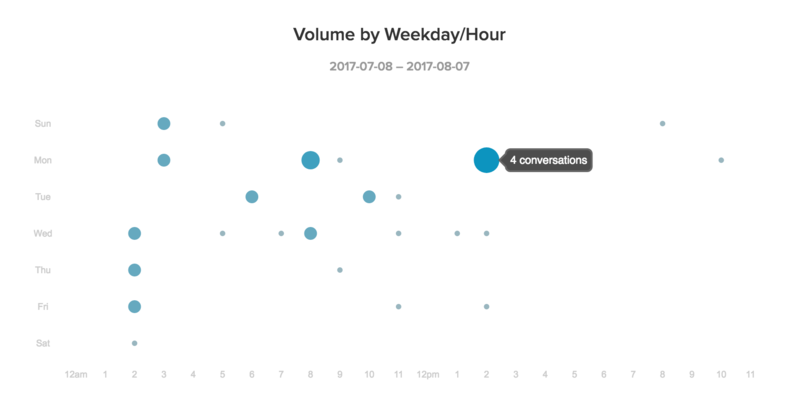 Last Week: Shows the number of incoming conversations last week. Yesterday: Shows the number of conversations received yesterday. Resolved: The number of conversations you and your team have resolved based on the time frame, channels, and tags as filtered above. Unresolved: The number of conversations still currently in the "unresolved" state during time frame. Archived: The number of conversations archived during the current time frame. Unhandled: The number of conversations currently unassigned to a staff agent and currently unresolved. This metrics is vitally important in understanding how many conversations are falling through the cracks. 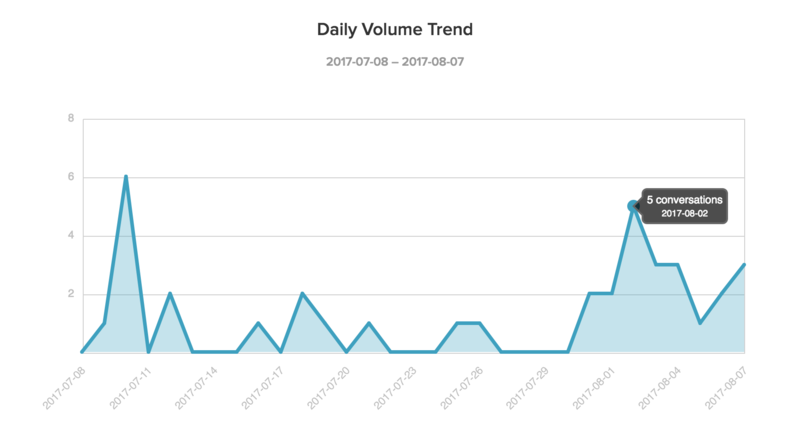 The daily volume trend graph gives you a visual overview of volume peaks and dips during the time frame you've filtered. Hovering your mouse over each day marker will show you how many incoming conversations were received. Volume trends can help you pinpoint days when you might need to dedicate additional support staff. This is a hotspot graph that gives you a visual overview of customer service hotspots (also known as velocity) during the week and broken down by hours of the day during the search time frame. You can download the current report as a csv file for importation into another analytics platform. What does each report mean?